Today is the last day of Women’s History Month. What I love about this month is seeing so many awesome quotes and stories of strong women who have succeeded in achieving their goals. It’s also the perfect time to share some of my favorite inspirational quotes. Some are from women in the present who lead by example and others are from those who are no longer with us but have left us with a history rich in inspiration. Whether or not you like Roseanne Barr, you can’t deny that she has achieved a tremendous amount of success as an actor, comedienne, producer and even businesswoman. I grew up watching Roseanne and loved the show. I have always admired the fact that she is as she is and was able to achieve that success without fitting into the stereotypical version of a Hollywood actress. Fun Fact: By its second season, Roseanne was number one in the Nielsen ratings and remained in the top four for six of its nine seasons. Resting on your talents or reputation alone is a sure road to failure. There is always someone who, though not as talented or reputable as you, is willing to learn and work 10 x harder. Dolly Parton knows her stuff. Love her #wisdom Go work hard and slay your week! Dolly Parton has been a favorite of mine since I was a little girl. I was never a huge fan of country music, but her songs and voice were on a different level. She is one of a very elite group of performers who has received a nomination for an Emmy, a Tony, a GRAMMY and an Oscar. Dolly vowed to help the people in her hometown. She made good on that promise with her theme park. Dollywood is the largest employer in Sevierville. I’ve always admired her grit and how proud she is of her family and her humble beginnings. In a time when everyone seems to be begrudging what their parents didn’t give them, she is an example of a person who lives in gratitude for what she did get. Fun Fact: Her parents paid for her birth with a sack of oatmeal because they were too poor and all they had to give the doctor was grain. This is actually a line out the poem, “I Dwell in Possibility” by Emily Dickinson. It is interpreted to mean that poetry is more powerful than prose, but I have always taken that first line literally. The reclusive American poet while unrecognized in her own time, became known posthumously for her innovative use of form and syntax. She is a perfect example of someone who broke every rule in poetry only to be recognized as the creator of her own style. Fun Fact: One of the books that made a mark on her life was Jane Eyre by Charlotte Brontë. It's #Friday !!!!! Gotta love some @oprah #wisdom. That is all. Oh yeah, have a fantastic day! I get that Oprah Winfrey is seen as cliche for successful women. Frankly, she has earned that honor. The woman came from ZERO and has built an empire. It was a heck of a gamble and a winning one at that. We still have work to do with regards to women’s equality. That said, the women who came before us were pioneers, navigating through a world that didn’t want them anywhere but in a kitchen and tending house. That is why women like Amelia Earhart are such important figures in women’s history and deserve to be spoken about and celebrated. Fun Fact: During World War I, Amelia became a nurse’s aid in Toronto, Canada, to tend to wounded soldiers. 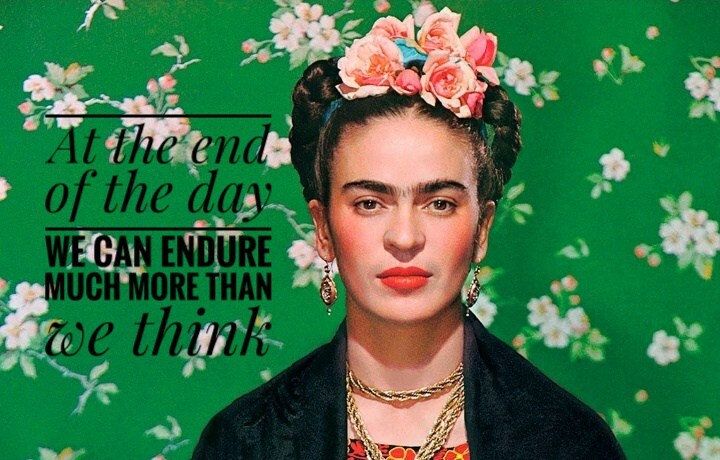 As amazingly talented as Frida Khalo was, she was also no stranger to pain. When she was 18, the bus Frida was riding in collided with a train. A handrail ripped through her torso, leaving her with a broken spinal column, collarbone, ribs and pelvis. Her leg was fractured in 11 places and she had a dislocated shoulder. She would undergo 30 surgeries through the course of her life including the amputation of her foot. She is an example of someone found a way to create a meaningful life despite having so many physical problems. Interesting Fact: The Louvre bought one of her paintings titled The Frame. It was the first work by a 20th century Mexican artist ever purchased by the internationally renowned museum. There really are many more women I admire and whose wisdom I regularly seek out for inspiration and motivation. What is one of your favorite quotes from a woman? “The biggest adventure you can take is to live a life of your dreams.” I totally agree with that. Doing what you want will make your life meaningful! All these quotes are so inspiring! they remind us that nothing is given, everything is owned. Society makes it harder for women, but inspiring them and pushing them to achieve more is essential! I have never heard the quote about the Peacock but enjoy it. I find posting quotes help me focus on what I want accomplish each day! Dolly has some really funny ones. My favorite is “The most effective way to do it – is to just do it”. So often I hear excuses when someone hasn’t even started to try. A great deal can happen if you just try. I agree Athena. It’s all about action. Thanks or dropping in! I love all of Oprah’s quotes. She’s such an inspiration for women everywhere. I love her stuff too. She kinda lost me for a while when she was so heavy into the “Power of Intention and the Secret” stuff but then she came right back lol. I love me some intention, but the action behind it is even more important. “At the end of the day we can endure much more than we think.” She inspires me because she created a meaningful life despite all her obstacles. She encourages me to keep moving forward no matter what life throws at me.